Distinctive pottery style from the south western United States; all known Mimbres cultural sites have been looted. ‘Mimbres’ is the term used to designate a sub region of the Mogollon cultural tradition centred on the Mimbres and Rio Grande Valleys of the Arizona/New Mexico border region. The ‘Classic Mimbres’ phase, which spanned from approximately 1000 to 1150 AD, is particularly known for its distinctive pottery. 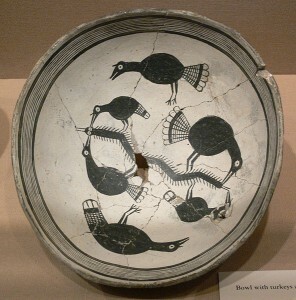 The Classic Mimbres pottery tradition is characterised by painted bowls decorated with geometric and figural designs in black on a white ground. The bowls are usually found in human burials and appear to be used to cover the face or head of the deceased. They often have a distinctive ‘kill hole’, an intentional puncture at the base of the bowl which appears to be associated with this ceremonial function. Mimbres sites have been known to archaeologists since the 1880s, however Classic Mimbres pottery was not described until the 1910s when J. Walter Fewkes of the Smithsonian Institution was shown some pieces by a local collector (Brody et al. 1997: 33). His reconnaissance survey of the area produced the collections of Mimbres pottery that were transported to the Smithsonian and the Museum of the American Indian in New York. Excavations conducted in the 1920s and 1930s produced most of the other museum collections of Mimbres pieces (Brody et al. 1997: 34). Archaeological excavations ceased at Mimbres during the Great Depression and a lack of formal archaeological oversight in the region led to nearly four decades of major looting. Not a single Mimbres cultural site escaped being looted (Brody et al. 1997: 34). In the 1960s looters began to use heavy machinery and earth movers to reach painted bowls more quickly. Because of this many Mimbres sites have been completely obliterated (Brody et al. 1997: 34). Mimbres presents an interesting case for how archaeologists might inadvertently stimulate demand for cultural property. In 1977, J.J. Brody, the former professor of Art History and Anthropology at the University of New Mexico and former director of the Maxwell Museum, released the popular volume Mimbres Painted Pottery (Brody 1977). Nearly three decades later, in the introduction to the revised edition of this book, Brody recounts that although he did not anticipate his book having an effect on the antiquities market, he believes that the book’s popularity directly contributed to the increase in looting of Mimbres sites in the 1970s and onwards (Brody 2005). The privately owned vessels pictured in Brody’s book experienced a sharp increase in their market value. They were, by association with Brody, ‘authenticated’ and they became ‘desirable trophies’ among collectors (Brody 2005). Brody records that he fears lawsuits if he refers to any privately owned Mimbres vessel as being ‘fake’, but now assumes that ‘any vessel that has neither provenience nor a solid provenance is either fake or so altered that it might as well be one’ (Brody 2005: xvi). So as to not contribute further to ‘an art marketplace that is childishly easy to manipulate’, the newest edition of Mimbres Painted Pottery only contains images of vessels in publicly owned collections (Brody 2005: xvi). Many Mimbres sites fall into the legal grey area that exists in the United States concerning public vs. private land. While looting on public land is prohibited under the Archaeological Resources Protection Act (ARPA) (United States of America 1979), and the disturbance of Native American burials on public land is a violation of the Native American Graves Protection and Repatriation Act (NAGPRA), looting on private land is less clearly regulated. It is simply harder to protect privately owned Mimbres sites from looting. In response to this situation, archaeologist Steven LeBlanc started the Mimbres Foundation at the University of New Mexico. This organisation used private contributions to buy privately owned Mimbres sites with the hopes of preserving them. Because The Mimbres Foundation was the legal landowner of these sites, they were able to prohibit looting activities by not granting looters access to the remains. As a case study, the Mimbres site of East Fork is located on the Mimbres River within New Mexico’s Gila National Forrest. In February 2000, officers from the USDA Forest Service noticed evidence of illicit digging at the site and set up seismic sensors near the site’s access trail in hopes of detecting a looting operation (Black 2001). Early in the morning on the 23rd of February the sensors were tripped and officers responded. They found brothers James and Mike Quarrel and nephew Aaron Sera digging at the site with shovels and picks (Black 2001). As the looting occurred on federal land the case was heard by the federal court in La Cruces, New Mexico. Sera pled guilty to misdemeanour charges but the Quarrell brothers faced felony charges under ARPA. These stemmed from the monetary assessment of the damage to the site. Causing damages in excess of $500 is classified as a felony under ARPA. Although the Quarrells admitted that they were trespassing (a misdemeanour), they argued that they had only just arrived at East Fork when they were caught, that they had only engaged in surface collection, and that the damage visible at the site was the work of other looters (Black 2001). After a short deliberation a jury declared the Quarrells guilty on all counts. They were sentenced to concurrent jail terms of a year and a day followed by a year of probation. They were each ordered to pay $4,362 for the restoration of the East Fork site and $15,253 as restitution for the damage that they caused (United States v. L Quarrell 2002). In 2002 the Quarrells appealed their conviction, arguing that the government did not prove that the defendants knew they were on public land and that the defendants were not permitted to present a defence based on a belief that they were excavating on private land (United States v. L Quarrell 2002). The court ruled that under ARPA the government did not need to prove that the defendants knew they were excavating on public land. The court agreed that a defendant should be able to mount a defence based on their belief that they were legally excavating on private land, but that ‘the defendant must establish that he reasonably believed he was lawfully excavating on private land because such “an honest mistake of fact would not be consistent with criminal intent”[…] However, if a defendant merely argues that he thought he was excavating on private land, such a mistake of fact would not negate criminal intent because such conduct is unlawful’ (United States v. L Quarrell 2002). In other words, the Quarrells had no reason to think that they were excavating lawfully on private property so such a defence could not apply in their case. The court did declare the $15,253 restitution order to be an abuse of discretion but upheld the $4,362 for site repairs. What is interesting about the Quarrell appeal on the grounds that they didn’t know that they were on federal land is that in October of 1975 Mike Quarrell (along with Charles and Frank Quarrell, family relationship unclear) was arrested for looting a different Mimbres site also within the Gila National Forrest (Collins and Green 1978). Mike and Charles Quarrell were charged with violating the Antiquities Act (United States of America 1906) and were tried before a United States Magistrate in Las Cruces, New Mexico in May of 1976. They were found guilty and sentenced to 40 hours of community service and 1 year of probation (Collins and Green 1978). Black, Kent (2001), ‘The Case of the Purloined Pots’, Smithsonian, 32 (6), 34-44. Brody, J.J. (1977), Mimbres Painted Pottery (Albuquerque: University of New Mexico Press). — (2005), Mimbres Painted Pottery, Revised Edition (Santa Fe: School for Advanced Research Press). Brody, J.J., Scott, Catherine J., and LeBlanc, Steven A. (1997), Mimbres Pottery: Ancient Art of the American Southwest (New York: Hudson Hills Press). Collins, Robert Bruce and Green, Dee F. (1978), ‘A Proposal to Modernize the American Antiquities Act’, Science, 202 (8), 1055-59. United States of America (1906), ‘Antiquities Act’, 16 USC 433. — (1979), ‘Archaeological Resources Protection Act’, 16 USC 470aa. United States v. L Quarrell (2002), 310 F3d 664 (United States Court of Appeals, Tenth Circuit).